As well as the Castle being open for you to come along and take a look around Tamworth Castle at your leisure, we also provide guided tours for private groups! If stepping through 900 years of history and uncovering the many secrets hidden in the ancient building- from sieges to royal visits and ghostly apparitions - appeals to you, a group of your friends or a social club you are part of why not get in touch? These informative and hugely sociable tours are available for groups of more than 20 people - both daytime and in the evening. You will be accompanied by one of our hugely knowledgeable costumed guide who will bring the buildings unique history to life - while you immerse yourself in our Castle's history. Hear tales of lords and ladies, maids and squires, discover the weight and feel of weapons, the costumes, while learning how our beautiful Castle has developed over the centuries. You tour will last approximately an hour and a half and for an For an extra £2.00 per person, tea, coffee and a generous slice of cake will be served in the 15th Century Great Hall! Prices vary depending on which tour and experience you and your group would like. If you are looking to organise a group booking or arrange a guided tour, call our specialist team and you will be on your way! There is also free admission and refreshment voucher for your coach driver and free admission for the group organiser. 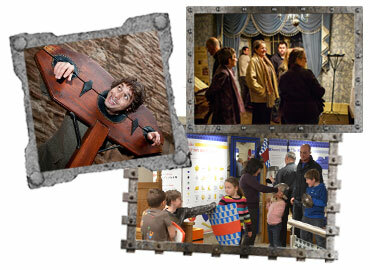 Please contact Tamworth Castle on 01827 709626 for up-to-date information and admission charges.